Pictured (right) is John J Audubon’s illustration of the Common Osprey Fish Hawk, today commonly referred to as the Osprey. This hand-colored lithograph is Plate #15 from the Octavo Edition of Birds of America – created from 1840 to 1844. “The habits of this famed bird differ so materially from those of almost all others of its genus, that an accurate description of them cannot fail to be highly interesting to the student of nature. The Fish Hawk may be looked upon as having more of a social disposition than most other Hawks. Indeed, with the exception of the Swallow-tailed Hawk (Falco furcatus), I know none so gregarious in its habits. It migrates in numbers, both during spring, when it shews itself along our Atlantic shores, lakes, and rivers, and during autumn, when it retires to warmer climes. At these seasons, it appears in flocks of eight or ten individuals, following the windings of our shores in loose bodies, advancing in easy sailings or flappings, crossing each other in their gyrations. During the period of their stay in the United States, many pairs are seen nestling, rearing their young, and seeking their food within so short a distance of each other, that while following the margins of our eastern shores, a Fish Hawk, or a nest belonging to the species, may be met with at every short interval. The Fish Hawk may be said to be of a mild disposition. Not only do these birds live in perfect harmony together, but they even allow other birds of very different character to approach so near to them as to build their nests of the very materials of which the outer parts of their own are constructed. I have never observed a Fish Hawk chasing any other bird whatever. So pacific and timorous is it, that, rather than encounter a foe but little more powerful than itself, it abandons its prey to the White-headed Eagle, which, next to man, is its greatest enemy. It never forces its young from the nest, as some other Hawks do, but, on the contrary, is seen to feed them even when they have begun to procure food for themselves. Notwithstanding all these facts, a most erroneous idea prevails among our fishermen, and the farmers along our coasts, that the Fish Hawk’s nest is the best scare-crow they can have in the vicinity of their houses or grounds. As these good people affirm, no Hawk will attempt to commit depreciations on their poultry, so long as the Fish Hawk remains in the country. But the absence of most birds of prey from those parts at the time when the Fish Hawk is on our coast, arises simply from the necessity of retiring to the more sequestered parts of the interior for the purpose of rearing their young in security, and the circumstance of their visiting the coasts chiefly at the period when myriads of water-fowl resort to our estuaries at the approach of winter, leaving the shores and salt-marshes at the return of spring, when the Fish Hawk arrives. However, as this notion has a tendency to protect the latter, it may be so far useful, the fisherman always interposing when he sees a person bent upon the destruction of his favourite bird. The Fish Hawk differs from all birds of prey in another important particular, which is, that it never attempts to secure its prey in the air, although its rapidity of flight might induce an observer to suppose it perfectly able to do so. I have spent weeks on the Gulf of Mexico, where these birds are numerous, and have observed them sailing and plunging into the water, at a time when numerous shoals of flying fish were emerging from the sea to evade the pursuit of the dolphins. Yet the Fish Hawk never attempted to pursue any of them while above the surface, but would plunge after one of them or a bonito-fish, after they had resumed their usual mode of swimming near the surface. The motions of the Fish Hawk in the air are graceful, and as majestic as those of the Eagle. It rises with case to a great height by extensive circlings, performed apparently by mere inclinations of the wings and tail. It dives at times to some distance with the wings partially closed, and resumes its sailing, as if these plunges were made for amusement only. Its wings are extended at right angles to the body, and when thus flying it is easily distinguishable from all other Hawks by the eye of an observer accustomed to note the flight of birds. Whilst in search of food, it flies with easy flappings at a moderate height above the water, and with an apparent listlessness, although in reality it is keenly observing the objects beneath. No sooner does it spy a fish suited to its taste, than it checks its course with a sudden shake of its wings and tail, which gives it the appearance of being poised in the air for a moment, after which it plunges headlong with great rapidity into the water, to secure its prey, or continues its flight, if disappointed by having observed the fish sink deeper. When it plunges into the water in pursuit of a fish, it sometimes proceeds deep enough to disappear for an instant. The sure caused by its descent is so great as to make the spot around it present the appearance of a mass of foam. On rising with its prey, it is seen holding it in the manner represented in the Plate. It mounts a few yards into the air, shakes the water from its plumage, squeezes the fish with its talons, and immediately proceeds towards its nest, to feed its young, or to a tree, to devour the fruit of its industry in peace. When it has satisfied its hunger, it does not, like other Hawks, stay perched until hunger again urges it forth, but usually sails about at a great height over the neighbouring waters. The Fish Hawk has a great attachment to the tree to which it carries its prey, and will not abandon it, unless frequently disturbed, or shot at whilst feeding there. It shews the same attachment to the tree on which it has built its first nest, and returns to it year after year. This species winters along the southern coasts of the Floridas, and proceeds eastward as the season advances. In the Middle Districts, the fishermen hail its appearance with joy, as it is the harbinger of various species of fish which resort to the Atlantic coasts, or ascend the numerous rivers. It arrives in the Middle States about the beginning of April, and returns southward at the first appearance of frost. I have occasionally seen a few of these birds on the muddy lakes of Louisiana, in the neighbourhood of New Orleans, during the winter months; but they appeared emaciated, and were probably unable to follow their natural inclinations, and proceed farther south. As soon as the females make their appearance, which happens eight or ten days after the arrival of the males, the love-season commences, and soon after, incubation takes place. The loves of these birds are conducted in a different way from those of the other Falcons. The males are seen playing through the air amongst themselves, chasing each other in sport, or sailing by the side or after the female which they have selected, uttering cries of joy and exultation, alighting on the branches of the tree on which their last year’s nest is yet seen remaining, and doubtless congratulating each other on finding their home again. Their caresses are mutual. They begin to augment their habitation, or to repair the injuries which it may have sustained during the winter, and are seen sailing together towards the shores, to collect the drifted sea-weeds with which they line the nest anew. They alight on the beach, search for the driest and largest weeds, collect a mass of them, clench them in their talons, and fly towards their nest with the materials dangling beneath. They both alight and labour together. In a fortnight the nest is complete, and the female deposits her eggs, which are three or four in number, of a broadly oval form, yellowish-white, densely covered with large irregular spots of reddish-brown. The nest is generally placed in a large tree in the immediate vicinity of the water, whether along the sea-shore, on the margins of the inland lakes, or by some large river. It is, however, sometimes to be seen in the interior of a wood, a mile or more from the water. I have concluded that, in the latter case, it was on account of frequent disturbance, or attempts at destruction, that the birds had removed from their usual haunt. The nest is very large, sometimes measuring fully four feet across, and is composed of a quantity of materials sufficient to render its depth equal to its diameter. Large sticks, mixed with sea-weeds, tufts of strong grass, and other materials, form its exterior, while the interior is composed of sea-weeds and finer grasses. I have not observed that any particular species of tree is preferred by the Fish Hawk. It places its nest in the forks of an oak or a pine with equal pleasure; but I have observed that the tree chosen is usually of considerable size, and not unfrequently a decayed one. The male assists in incubation, during the continuance of which the one bird supplies the other with food, although each in turn goes in quest of some for itself. At such times the male bird is now and then observed rising to an immense height in the air, over the spot where his mate is seated. This he does by ascending almost in a direct line, by means of continued flappings, meeting the breeze with his white breast, and occasionally uttering a cackling kind of note, by which the bystander is enabled to follow him in his progress. When the Fish Hawk has attained its utmost elevation, which is sometimes such that the eye can no longer perceive him, he utters a loud shriek, and dives smoothly on half-extended wings towards his nest. But before he reaches it, he is seen to expand his wings and tail, and in this manner he glides towards his beloved female, in a beautifully curved line. The female partially raises herself from her eggs, emits a low cry, resumes her former posture, and her delighted partner flies off to the sea, to seek a favourite fish for her whom he loves. The young are at length hatched. The parents become more and more fond of them as they grow up. So truly parental becomes the attachment of the old birds, that an attempt to rob them of those dear fruits of their love, generally proves more dangerous than profitable. Should it be made, the old birds defend their brood with great courage and perseverance, and even sometimes, with extended claws and bill, come in contact with the assailant, who is glad to make his escape with a sound skin. The young are fed until fully fledged, and often after they have left the nest, which they do apparently with great reluctance. I have seen some as large as the parents, filling the nest, and easily distinguished by the white margins of their upper plumage, which may be seen with a good glass at a considerable distance. So much fish is at times carried to the nest, that a quantity of it falls to the ground, and is left there to putrify around the foot of the tree. Only one brood is raised each season. The Fish Hawk seldom alights on the ground, and when it does so, walks with difficulty, and in an extremely awkward manner. The only occasions on which it is necessary for them to alight, are when they collect materials for the purpose of repairing their nest, or for building a new one, in spring. I have found this bird in various parts of the interior of the United States, but always in the immediate neighbourhood of rivers or lakes. When I first removed to Louisville in Kentucky, several pairs were in the habit of raising, their brood annually on a piece of ground immediately opposite the foot of the Falls of the Ohio in the State of Indiana. The ground belonged to the venerable General CLARK, and I was several times invited by him to visit the spot. Increasing population, however, has driven off the birds, and few are now seen on the Ohio, unless during their migrations to and from Lake Erie, where I have met with them. I have observed many of these birds at the approach of winter, sailing over the lakes near the Mississippi, where they feed on the fish which the Wood Ibis kills, the Hawks themselves being unable to discover them whilst alive in the muddy water with which these lakes are filled. There the Ibises wade among the water in immense flocks, and so trample the bottom, as to convert the lakes into filthy puddles, in which the fishes are unable to respire with ease. They rise to the surface, and are instantly killed by the Ibises. The whole surface is sometimes covered in this manner with dead fish, so that not only are the Ibises plentifully supplied, but Vultures, Eagles, and Fish Hawks come to participate in the spoil. Except in such places, and on such occasions, I have not observed the Fish Hawk to eat of any other prey than that which it had procured by plunging headlong into the water after it. 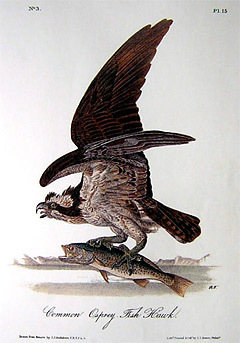 I have frequently heard it asserted that the Fish Hawk is sometimes drawn under the water and drowned, when it has attempted to seize a fish which is too strong for it, and that some of these birds have been found sticking by their talons to the back of sturgeons and other large fishes. But, as nothing of this kind ever came under my observation, I am unable to corroborate these reports. The roosting place of this bird is generally on the top branches of the tree on which its nest is placed, or of one close to it. Fish Hawks are very plentiful on the coast of New Jersey, near Great Egg Harbour, where I have seen upwards of fifty of their nests in the course of a day’s walk, and where I have shot several in the course of a morning. When wounded, they defend themselves in the manner usually exhibited by Hawks, erecting the feathers of the head, and trying to strike with their powerful talons and bill, whilst they remain prostrate on their back. The largest fish which I have seen this bird take out of the water, was a weak-fish, such as is represented in the plate, but sufficiently large to weigh more than five pounds. The bird carried it into the air with difficulty, and dropped it, on hearing the report of a shot fired at it. FISH HAWK, Falco Haliaetus, Wils. Amer, Orn., vol. v. p. 13. FALCO HALIAETUS, Bonap. Syn., p. 26. FISH HAWK or OSPREY, Falco haliaetus, Aud. Orn. Biog. vol. i. p. 415; vol. v. p. 362. Bill brownish-black, blue at the base and margin; cere light blue. Iris yellow. Feet pale greyish-blue, tinged with brown; claws black. The general colour of the upper parts is dusky brown, the tail barred with pale brown. The upper part of the head and neck white, the middle part of the crown dark brown. A broad band of the latter colour from the bill down the side of the neck on each side. Under parts of the neck brownish-white, streaked with dark brown. Under parts generally white. Anterior tarsal feathers tinged with brown.